Earlier this month, I spent two days in Guatemala meeting with Central American leaders about our mutual efforts to tackle one of the most significant and urgent challenges facing the Western Hemisphere: bringing stability to this impoverished and violent region. 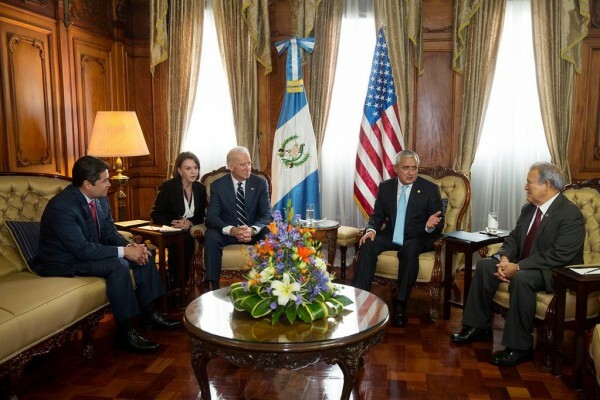 Biden was speaking during a two-day visit to Guatemala this week, where he met with President Otto Pérez Molina, as well as El Salvador’s President Sánchez Cerén and Honduran leader Juan Orlando Hernández. The president and I are determined to address conditions in El Salvador, Guatemala and Honduras and help these countries on their path to economic prosperity. To that end, we requested $1 billion in next year’s budget to help Central America’s leaders make the difficult reforms and investments required to put the region on a more stable and sustainable path. But we are just as determined to see these countries make their own commitments to depart from business as usual and embark on a serious new effort to deliver opportunity and security to their long-suffering people. As I told these leaders back in June — and I reiterated earlier this month — as long as you are on the path to meaningful and lasting change, the United States will be there with you. What we have seen since then has not been business as usual in Central America. With our support, the leaders of the region have committed themselves to a joint plan with the Inter-American Development Bank called the Alliance for Prosperity. It includes reforms of the police systems, the expansion of community centers to create the conditions we know prevent migration, measures to reduce poverty, steps to attract foreign investment and the continuation of our successful efforts to target smuggling networks. These are challenges the region has long faced but lacked the political will necessary to address. Even before my recent visit, El Salvador, Guatemala and Honduras had quickly taken steps to start implementing the Alliance for Prosperity. Honduras signed an agreement with an international nongovernmental organization to increase governmental transparency. Guatemala has added new law enforcement officers and reassigned others to areas most in need, helping to reduce Guatemala’s murder rate by one-third. El Salvador passed a law providing new protections for investors. Develop programs to address domestic violence and promote women’s domestic empowerment by 2016, and to send experts to help. A great deal of work lies ahead. We have requested $1 billion for Central America in 2016 because Central America cannot do it alone. If the United States is not present, these reforms will falter. But the combination of Central American political will and international support can be transformative, especially since the three governments have committed to match or exceed international assistance to their countries. We intend to focus our assistance in three areas. • First, improvements in security are essential. El Salvador, Guatemala and Honduras have three of the five highest per capita murder rates in the world. But some communities in Guatemala and El Salvador are already seeing reductions in violence from well-proven U.S.-sponsored programs in community policing, specialized training, and youth centers similar to the Boys and Girls Clubs. We want to help their governments extend these programs to help stabilize neighborhoods and eradicate transnational criminal networks that threaten Central America’s communities and our own. • Second, in the 21st century, good governance is essential to attracting jobs and investment. Court systems, government contracting and tax collection are not widely perceived as fair or transparent. The countries of Central America have some of the lowest effective tax rates in the Americas. Central American countries need to do a better job collecting and managing revenues to invest in their own futures. We will assist in these efforts. • Third, we are ready to offer technical expertise to help Central American countries attract significantly greater private investment. It’s no secret what is required: clear and streamlined rules and regulations, protections for investors, curbs on corruption, courts that adjudicate disputes fairly, and protections for intellectual property. As we request $1 billion from the United States Congress to empower Central American leaders to address each of these challenges, our own government needs to move quickly to show results and hold ourselves accountable as well. That means rigorously evaluating our programs to build on what works and eliminate what doesn’t deliver the impact we need. The process is already underway, and we look forward to working closely with Congress to craft the most effective assistance package. This level of support is nearly three times what we have provided to Central America in the recent past. But the cost of investing now in a Central America where young people can thrive in their own communities pales in comparison to the costs of another generation of violence, poverty, desperation and emigration. The challenges ahead are formidable. Solving them will take years. But Central America’s leaders have now laid out a shared plan to move their region forward and taken the first steps to make it a reality. If they can deliver, Central America can become the next great success story of the Western Hemisphere. We seek Congress’s help to make it so.